Ceiling in black and white. The original black and white photograph of the Magic Chef Building's lobby presents a somewhat different image of the space when compared to the colorized version initially published. 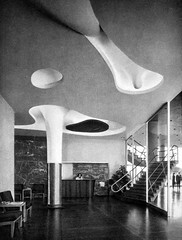 The ceiling design was a collaboration of Isamu Noguchi working along with Harris Armstrong. This is the same image that was colorized when published in The Architectural Forum.